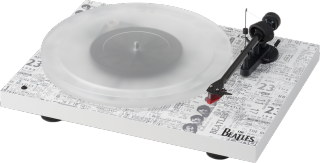 Pro-Ject reveals limited edition '1964' Beatles turntable | What Hi-Fi? Based on the Debut Carbon Esprit SB, this record player follows the George Harrison version that was announced in January. Four more special edition Beatles turntables are on the way. Following the release of the George Harrison record player, Pro-Ject and Universal Music Group have revealed plans for five more special edition turntables. The first is this '1964' turntable, which includes copies of original tickets for the band's concerts between 1962 and 1966. The ink of the design has been dried out with special ultra-violet lights that are apparently the best way to ensure that "all the details are transformed without loss and smear to the turntable". The turntable itself is the Debut Carbon Esprit SB, which features an Ortofon 2M Red stylus attached to its carbon tone-arm, an acrylic platter, as well as built-in electronic speedcontrol for switching between playback speeds. There will be four more Beatles decks, for a total of six. Details on those designs have yet to be released. If you want to get your hands on this 1964 turntable, you'll have to move quick. There are only 2500 available worldwide - priced at 650€ (approximately £550). If that's a little steep, then maybe you can take solace in one of Universal's MQA encoded tracks instead.